After Harvey, Houston Cancer Hospital Begins Recovery : Shots - Health News During Harvey, doctors, nurses, technicians and facilities staff tended to inpatients at MD Anderson Cancer Center. Now the hospital is working to get outpatients back for care as well. The University of Texas MD Anderson Cancer Center had 528 patients in the hospital as Harvey hit. A team of about 1,000 people tended to them and their families until reinforcements arrived Monday. Lu is a professor of gynecologic oncology and interim chief medical officer at the University of Texas MD Anderson Cancer Center, a top cancer hospital and research center. Earlier that morning, the hospital had sent a high-water vehicle — a box truck — to Lu's neighborhood, and she walked eight blocks through flooded streets to meet it. When the water was highest, what did that look like? The main road that leads to the hospital was a river of about 4 feet of water. Amazingly, our buildings withstood the storm. 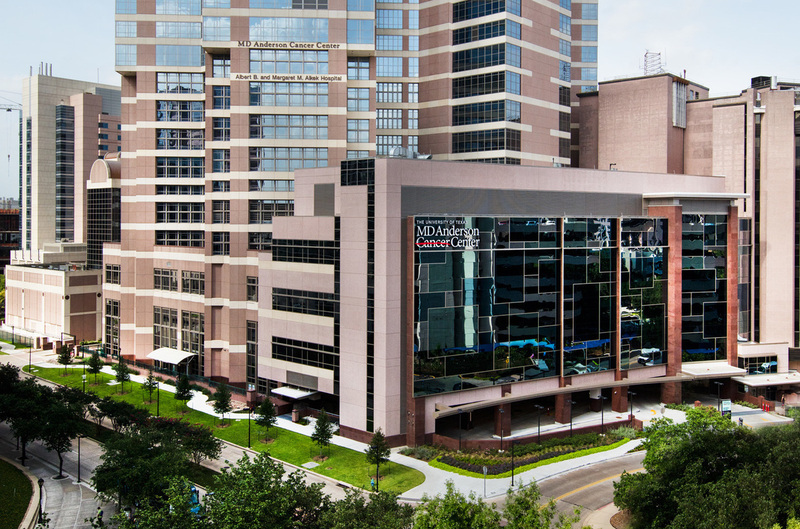 Over the last decade, the Texas Medical Center has re-engineered the area so that there are floodgates that go up, and that really protected the buildings. There were no patient care areas that were impacted by the storm. You have a ride-out team, which refers to staff who have agreed to stay put and ride out the storm. How did that work? We had about a thousand staff here. The unsung heroes in this disaster are our nurses, our lab techs, our pharmacy techs, our food services, our security who kept [everyone] safe. We had 528 patients who were in the hospital on Sunday morning and probably another couple hundred family members. We were really able to care for these very sick individuals. There was no compromise in our ability to care for them. What about those outpatients whose appointments were canceled? [Thursday] morning, we moved to limited outpatient services. We've had our teams, even while they have been at home, going through and looking at who urgently needs treatment. So already yesterday, we were able to address these urgent needs — in surgery, for chemotherapy as well as radiation therapy. When you talk about surgery, it's not just the surgeon. It's the [operating room] nurse. It's the surgical tech. It's the individuals who sterilize our instruments. So, while you can have a surgeon on site, it's all those other team members that it really takes. So yesterday, we tested to be able to see that we could safely provide care, and we were able to do two OR cases, we were able to treat over 50 individuals for radiation, and we were able to treat about 35 very sick [leukemia patients] who needed blood products. And today, we're ramping up and doing more. And there's an army of people trying to reach out to patients to get them rescheduled. Your staff at the hospital is obviously just as affected as everyone else. Absolutely. Prior hurricanes have impacted our buildings. Other hurricanes have impacted our research enterprise, our laboratory animals. I have to say what Harvey's impacted is our staff. And that's what's so heartbreaking. We believe that somewhere between 30 [and] 60 percent of our workforce has been impacted by Harvey — people whose homes have been flooded and who have been asked to evacuate. Have you made it home since Sunday? I have. And I'm glad, because I really need a clear head to lead our team to recovery. We're energized here at MD Anderson. Our patients are our focus, and we know that they need us. Morning Edition editor Gail Austin and producers Maria Paz Gutierrez and David Fuchs contributed to this story.